Jan 26th, 2016: Attended Economic Prosperity, Environment and Highways Board: Agenda here. At the meeting, in response to a resident experience survey, I raised my concerns about the Local Area Committee, how it functions, and the need for it to be more user friendly. Subsequently met with SCC’s Community Partnership Team to discuss (March 7th, 2016). My key concerns: public not clear about purpose and function of LAC, distinction between public and private meeting. LAC is a private committee meeting held in public, should be more of a conversation with residents- too restrictive in terms of discussion, officers’ expertise not always fully used, suggest chair should rotate- current chair in post for 6 years, more use of social media before, during and after meetings. 9th February 2016: Attended Full Council: Agenda here. In this meeting SCC discussed budgets for 2016/2017 to 2020/2021. Here is a press statement from the independent councillors and residents’ association councillors for Surrey County Council. Also, you may be interested to read my colleague, Eber Kington’s Budget Statement during the meeting. March 10th, 2016: Attended Economic Prosperity, Environment and Highways Board: Agenda here. In the meeting, there was a Project Horizon Year 4 discussion. I raised the issue of Blackdown Lane that due to an administrative error was not completed as agreed in the Year 3 program. The Project Horizon team confirmed that Blackdown Lane is on the Year 4 program, a date to be confirmed as due to severe central government grant cuts to SCC the final highways budget has not been settled. March 15th, 2016: Attended Full Council. Agenda here. Local Area Committee (LAC) – Community Engagement meeting: how to make Local Area Committee more accessible. Friday, 18 March 2016 1.30 pm, Godalming Baptist Church, Queen Street, Godalming GU7 1BA: Agenda here. You can follow local committee updates here on Twitter and here on the web. The Haslemere Station Community Partnership has now formally established, via a legal agreement with South West Trains (SWT). 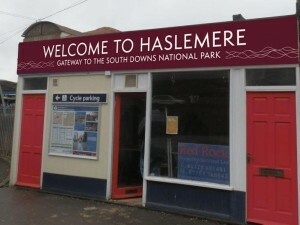 Haslemere station is the main transport hub in the town, with over 1.3 million passenger journeys/year. 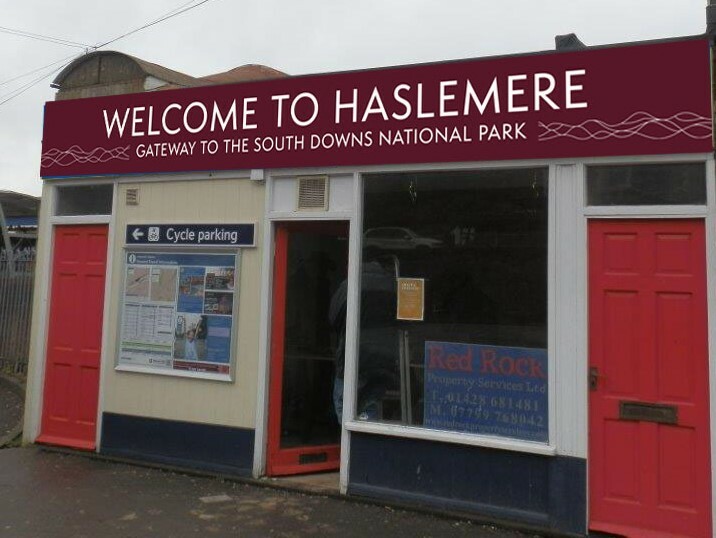 The aim of the partnership, to improve the look of the station with planting, and better signage and also to use the station as a ‘gateway’ to promote Haslemere, its events, community assets, businesses and the wonderful surrounding countryside to both visitors and residents. To date the partnership includes: South West Trains, Surrey County Council, Haslemere Town Council, Haslemere Visitor Information Centre, South Downs National Park Authority, Haslemere Chamber of Trade, Haslemere Fringe, Haslemere Vision and the National Trust. SWT community stakeholder team has match funded any contributions made by partners- to date SWT have awarded £5000, I have awarded £1200 from my SCC Members Allocation. The station community partnership has been granted a short term lease on the vacant shop at the station. The plan is to create a Haslemere community information point. A team of volunteers, headed by Ken Griffiths has transformed the shop and a launch is planned in the next couple of weeks. Haslemere Train Station: I’ve had several meetings with SWT engineers/arboriculture team to discuss the removal of all vegetation along the car park boundary in preparation for the additional deck at the car park. I have been working closely with SWT, pressing for maximum screening to reduce the visual impact of the metal structure. SWT have agreed to plant a screening hedge, with some specimen trees- although behind the current bus layby the pilings for the new structure will be too close to the pavement edge, so no planting will be possible. I am investigating whether a cantilevered, lit shelter would be possible along this section to provide a dry pick up and drop off area for train and bus passengers. In response to a number of resident inquiries, SWT requires no planning permission for the car park, planning permission is deemed granted by virtue of Part 8 of the GPDO (2015). I wrote about parking at the station here earlier this year. 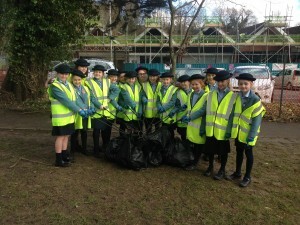 St Ives School: Year 5, girls very concerned about litter, and the negative impact on the environment. Accompanied year 5 girls on Lion Green, as they picked up several sacks of litter as part of ‘Clean for the Queen’ initiative. I was impressed by how much they cared about their town, and the environment, how well informed they were and how much they wanted to do something to make a difference. 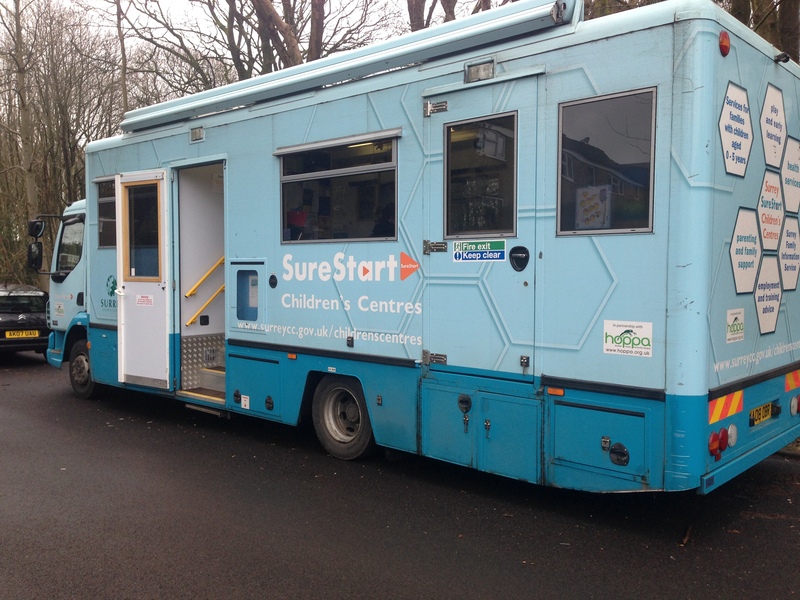 Sure Start Play Bus, Woolmer Hill, met with local mums and tots on the bus. 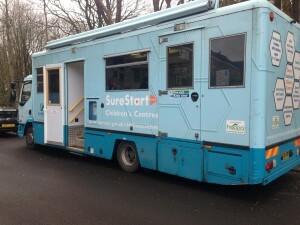 Sure Start Centre provides excellent support for parents and early years children. Haslemere Station Travel Plan: Haslemere Station Travel Plan: Surrey County Council, in partnership with Haslemere Vision has commissioned a Station Travel Plan with the aim of understanding how people get to and from the station, the issues all users of the station experience, and to identify barriers to accessing the station without the use of a private car. A survey of train users, non-train users, local businesses and other key community stakeholders has been carried out. There was a very high survey response rate, over 1600 responses – all data is currently being processed. Two concluding workshops will be held on March 22nd, 2016 in the Georgian House Hotel. I will publish the final report including all recommendations on this site. Interviewed by BBC Surrey regarding council budget cuts on 3rd February. Sandrock. New lighting columns are now installed and connected to electricity. Shepherds Hill sink hole repaired. Updates were here and here and also on my Facebook page and Twitter feed. Thanks again to all for their patience whilst the works and investigations were carried out. 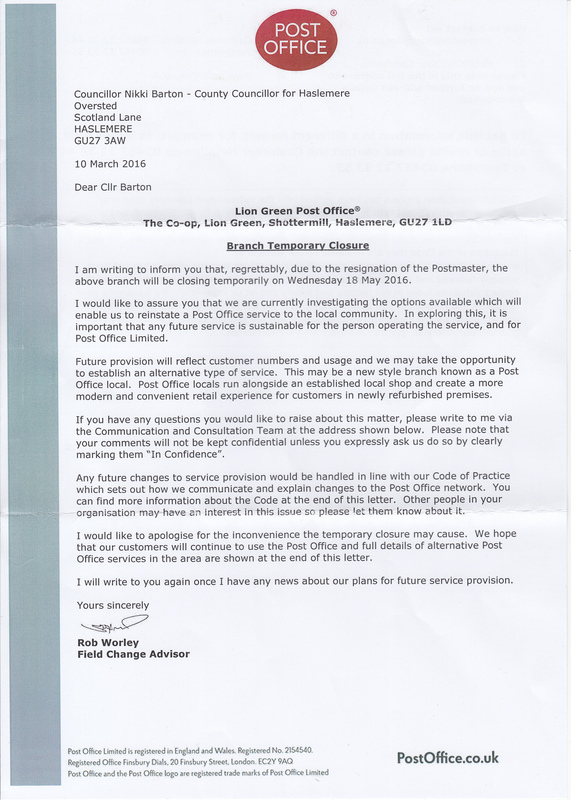 Lion Lane Post Office Update. 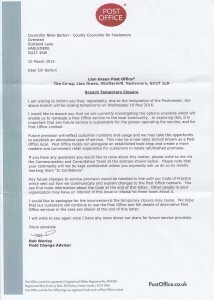 I received this letter from the Post Office about the closure of their operation in the former Coop, now M&S, supermarket in Lion Lane. South Downs NPA Volunteering Opportunities Map – which enables organisations with volunteer opportunities to promote these opportunities to a wider audience. Here is a link to their website and map. LittleLumpy is an annual cycling event which raises funds for the Haslemere Fringe. It has 4 routes with a new family-friendly route this year. Early bird discount ends March 2015. Check out the Little Lumpy website here. Their early bird registration fee ends 31st March 2016. 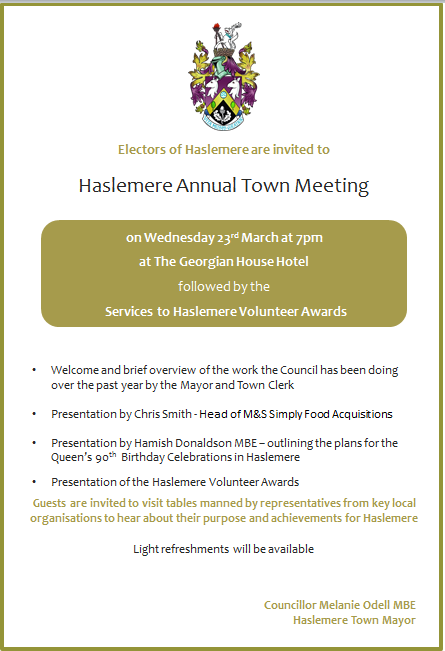 Haslemere Annual Town Meeting with a talk about Queen’s 90th birthday celebrations plus town volunteer awards will be on 23rd March 2016 (click on picture below to read invitation). South West Trains Travel Promotion. Can you help complete the Hindhead Tunnel story? Circle Eight have recently announced that its next local interest production will tell the Hindhead Tunnel story from pipe dream to reality. The film will also tell the history of the A3 at Hindhead and will examine the impact the Tunnel has had on the Hindhead area since it opened nearly 5 years ago. They are eager to collect the views, stories and anecdotes of people who live and work in the locality. In particular they would be very keen to view any film or video local people may have of the area in the past and of the Tunnel construction. If you believe you have something to contribute to the film, please contact Michael Orford at michaeleo@btinternet.com or on 01428 644871. Please see this link re SCC’s Recycling Reduced Hours. Also see here for information about recycling in Haslemere. Please see here about the Parenting Puzzle course organised by Tennyson’s Sure Start Centre on Wednesday 4th May 2016 12.30pm – 2.30pm. Crèche provided. To be held at The Hen House. This entry was posted in Councillor Barton Update and tagged Clean For The Queen, Haslemere, Haslemere Conservation Area Appraisal, Haslemere Station Community Partnership, Lion Lane Post Office, Members' Allocation, Sandrock Lighting, Shepherds Hill, Sure Start Play Bus, Surrey County Council, Waverley Local Area Committee on March 13, 2016 by admin. 1. APOLOGIES FOR ABSENCETo receive any apologies for absence. 2. MINUTES OF PREVIOUS MEETING PDF 156 KB To approve the minutes of the previous meeting as a correct record. The Committee is also asked to note the actions contained in the Decision Tracker. 3. DECLARATIONS OF INTERESTTo receive any declarations of disclosable pecuniary interests from Members in respect of any item to be considered at the meeting. · In line with the Relevant Authorities (Disclosable Pecuniary Interests) Regulations 2012, declarations may relate to the interest of the member, or the member’s spouse or civil partner, or a person with whom the member is living as husband or wife, or a person with whom the member is living as if they were civil partners and the member is aware they have the interest. · Members need only disclose interests not currently listed on the Register of Disclosable Pecuniary Interests. · Members must notify the Monitoring Officer of any interests disclosed at the meeting so they may be added to the Register. · Members are reminded that they must not participate in any item where they have a disclosable pecuniary interest. 4. PETITIONS PDF 70 KB To receive any petitions in accordance with Standing Order 68. Notice should be given in writing or by email to the Community Partnership and Committee Officer at least 14 days before the meeting. Alternatively, the petition can be submitted on-line through Surrey County Council’s e-petitions website as long as the minimum number of signatures (30) has been reached 14 days before the meeting. Details of petitions to be presented are attached. 5. FORMAL PUBLIC QUESTIONSTo answer any questions from residents or businesses within the Waverley Borough area in accordance with Standing Order 69. Notice should be given in writing or by email to the Community Partnership and Committee Officer by 12 noon four working days before the meeting. 6. MEMBER QUESTIONSTo receive any written questions from Members under Standing Order 47. 7. ALLEGED PUBLIC FOOTPATH BETWEEN PETWORTH ROAD/LOWER STREET AND COLLEGE HILL, HASLEMERE (OTHER COUNTY COUNCIL FUNCTIONS) PDF 941 KB To decide whether public footpath rights are recognised over the route shown on DrawingNo. 3/1/20/H48 and whether a Map Modification Order under sections 53 and 57 of the Wildlife and Countryside Act 1981 should be made to modify the Definitive Map and Statement. Details of the arrangements for public speaking on this item are appended. 8. HIGHWAYS UPDATE (EXECUTIVE FUNCTION) PDF 77 KB To receive an update on the 2015/16 programme of highway improvement and maintenance works funded by this committee. 9. VARIOUS ROADS IN WAVERLEY: SPEED LIMIT ASSESSMENT (EXECUTIVE FUNCTION) PDF 120 KB To consider and respond to the speed limit assessments contained in the report. 10. LOCAL COMMITTEE FORWARD PROGRAMME (SERVICE MONITORING AND ISSUES OF LOCAL CONCERN) PDF 23 KB To review the forward programme for 2015-16 and agree arrangements for 2016-17. 11. CHANGES TO THE COMMUNITY YOUTH WORK SERVICE IN WAVERLEY (EXECUTIVE FUNCTION) PDF 192 KB To approve proposals for the delivery of youth work in Waverley as formal guidance for the Community Youth Work Service. 12. ANNUAL PERFORMANCE REPORT FROM SERVICES FOR YOUNG PEOPLE (SERVICE MONITORING AND ISSUES OF LOCAL CONCERN) PDF 89 KB To receive an update on the support given by Services for Young People to develop the employability of young people in Waverley during 2014/15. 13. ANNUAL REPORT OF THE SAFER WAVERLEY PARTNERSHIP (SERVICE MONITORING AND ISSUES OF LOCAL CONCERN) PDF 104 KB To comment on the partnership’s activities and plans. 14. PROMOTING RESILIENCE TO FLOODING (SERVICE MONITORING AND ISSUES OF LOCAL CONCERN) (TO FOLLOW)To receive an update on arrangements put in place since the winter of 2013/14 (REPORT TO FOLLOW). This entry was posted in Meetings and tagged Surrey County Council, Waverley Local Area Committee on September 17, 2015 by admin. Here is an update of my recent meetings and some local highways issues. 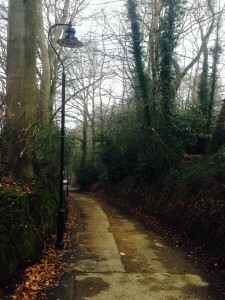 Haste Hill, recently resurfaced under Project Horizon as scheduled. Inexplicably, Blackdown Lane has not been resurfaced at the same time, despite being originally included as part of the Haste Hill Project Horizon scheme. 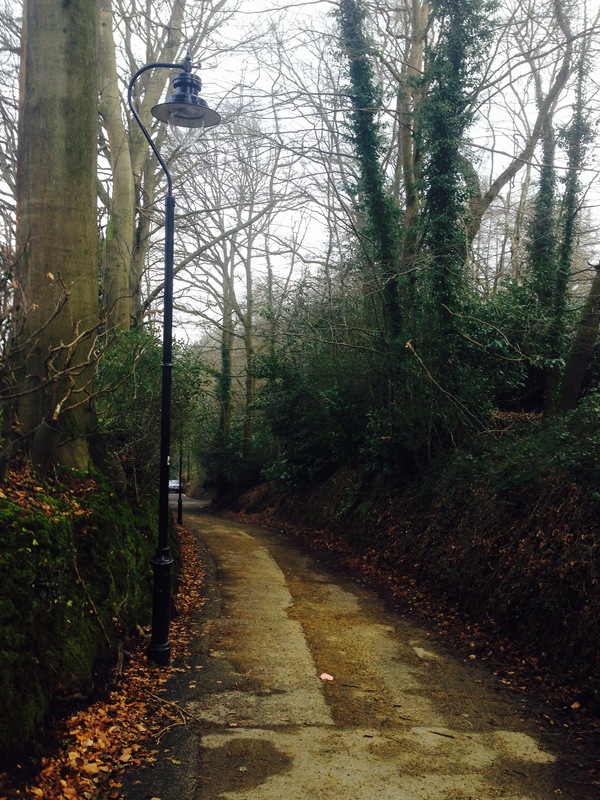 The explanation from SCC is that the relatively recent naming of Blackdown Lane, (previously unnamed) has meant that only the Haste Hill section has been resurfaced. Understandably a number of residents have raised this anomaly with me, given the very poor state of Blackdown Lane, and the high volumes traffic using this route. I am pressing the SCC highways leadership to reconsider this decision. Lion Lane resurfacing, a local resident has complained that Lion Lane has been resurfaced again, despite not being in need of this work having been relatively recently treated. Unfortunately I inherited a list of roads to be resurfaced that became part of a fixed highways works program. I consider a number of these roads fail to meet the required “needs” criteria while other roads are in far greater need of attention, for example Wey Hill and Derby Road East were not included. I successfully lobbied for both these roads to be resurfaced in addition to the existing list. Railings replacement currently ongoing, High Street: a number of shop owners are frustrated that the works are taking so long, given the congestion and upheaval caused by the traffic lights. Of specific concern is the apparent short working day of the railing work crew. I have raised this with SCC highways management for their response as this is clearly an unacceptable situation. 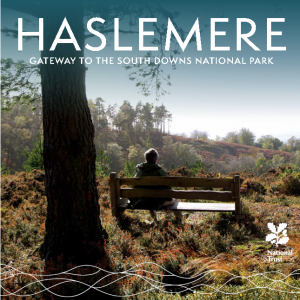 15 May: Haslemere Visitor Information Centre, Haslemere Town Council to discuss Haslemere tourist information at train station at Haslemere Museum. Haslemere train station is the transport hub for the town, with thousands of people passing through as passengers and dropping off every day- the station has the highest passenger count of all stations in the SWT network, and there are a growing number of walkers arriving in Haslemere by train, particularly from London to explore the beautiful surrounding countryside. 18 May: Visit to Stepping Stones School, Hindhead with Linda Keminey, Cabinet Member for Schools and Learning. Students gave excellent tour and provided an excellent tea. Also visited Undershaw to see progress of major works to renovate and restore author Conan Doyles house. Recent decision by Sec of State not to challenge the granted planning permission is excellent news. The expanded Stepping Stones in Undershaw will be provide an exceptional facility offering outstanding education for children with special learning needs, as well as enabling the local residents and the wider community of Sherlock Holmes fans the chance to visit the restored home of the infamous local writer. June 3: Attended Half Moon Estate Residents’ Association AGM and presented plans for a traffic calming initiative at the junction of Hill Road with Shepherds Hill. This came about as a result of a police speed check showing speeds of up to 59mph in a 30mph speed area. 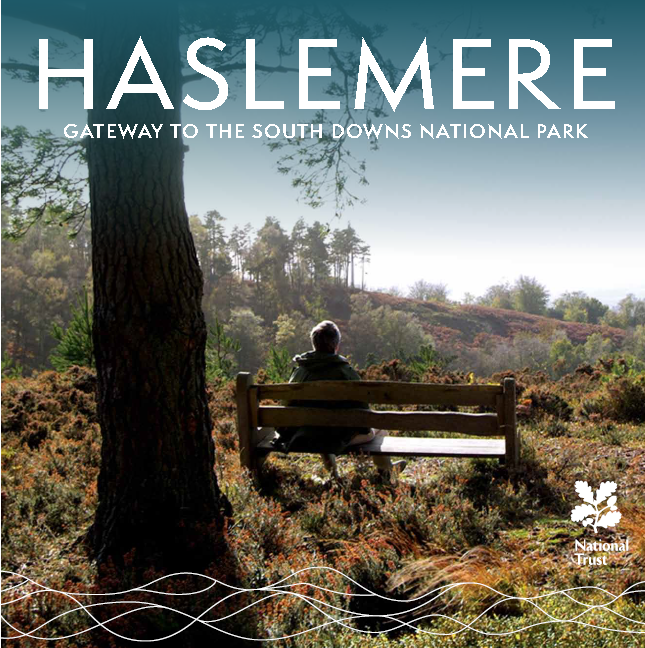 June 5: SWT Stakeholder Manager and Haslemere Visitor Information Centre team to discuss promoting Haslemere as a tourist destination by providing visitor information at the train station. This was very positively received by SWT, with the agreement to provide a local events board and visitor information leaflet rack at the station. Discussed the recent East Hampshire Community Rail Partnership, a partnership initiative between E Hants CC and SWT to promote train based tourism between Liphook and Rowlands Castle, a map promoting each station town on the route has been produced. In addition there has been an investment in making each station in the scheme more attractive, with planting etc. It would be very positive for Haslemere to be included in this scheme – given all Haslemere and countryside has to offer, I am continuing to take this forward. June 8: Brighter Futures course at Haslewey (funded by my members allocation 2014-15), met participants in the course aimed at helping the long term unemployed get back into work. When I started the ‘Brighter Futures’ course in mid May, I had been unemployed for five months and despite applying for roughly twenty to twenty-five jobs a week, I had only a couple of interview offers in that time. This was having a very negative effect on my confidence and self esteem. Since then I am amazed at how my confidence has risen dramatically, in just three to four weeks. And I have a much more positive outlook on life and searching for work too. This is because I have used the course content to alter how I percieve people and hopefully change their perception of me too. This sets out my personality traits, which outlines personal strengths and tries to pinpoint weaknessses interacting with other personality types in the workplace. Complimentary personalities work much better together than conflicting types. Guidelines on how to form a CV to appeal to employers. And the importance of the covering letter in addition to the CV. The focus of this week is the astounding amount of differing volunteer opportunities there are for everyone. I found that I was rather ignorant of the many different ways to volunteer. The positive impact it could have on my self confidence is good from a work search pespective too. And the possibility of adding new skills to enhance my CV. Various techniques to impress employers and calm oneself down at interviews. It emphasised the importance of the job being right for both parties, not just the employer. 1. Due to the changes made to the CV I am receiving a lot more interview offers. 2. Feel a lot better about myself, especially getting interviews. Don’t feel like an invisible unemployable old man now. 3. My Lumina Spark report stated I could be introverted. (I already knew this) Seeing it in black and white made me consider how I interact with others, and as a result I am very comfortable expressing myself more in a group than I would of in the past. 4. The group itself is easy going and light-hearted, we all appear to get along. I work better in an informal group, also improving social skills as a bonus. 5. I recently had an interview, where I used aspects of all three weeks of the course. The new improved CV got me the interview. I thought about if i had a rapport with the interviewer, and tried to engage him on a more personal level when I felt I did not see eye to eye. I got very nervous, as usual, but used the experience of the previous weeks interview role-play to calm myself down and have a relatively stress free interview. I am convinced this would not have happened a month ago. 6. Have a ‘can do attitude’, we just have to know anything is possible, set goals and have the will to achieve them. I really want to thank you for giving me hope for the future, when I started I was at a very low point. Brighter Futures could not be better titled in my opinion. June 12: SCC Waste Group, Haslemere Town Council to discuss public information strategy in preparation for withdrawal of Saturday morning dustcart service in Wey Hill carpark. Service to be discontinued autumn 2015. The service currently costs £30,000 per year. The mix of waste put in the dust cart has been analysed, finding that a high % of this waste could be recycled, but instead ends up in costly and environmentally damaging landfill. Discussed the need to ensure WBC recycling bins at Wey Hill regularly emptied and confirmed that residents can leave additional recycling on kerbside for collection. Additional blue wheelie bins can be ordered from WBC free of charge by phone and on WBC website. CCTV surveillance will monitor any potential fly tipping at Wey Hill car park. 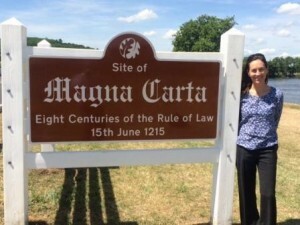 June 15: Magna Carta celebration, Runnymede. Fantastic event organised by SCC and the National Trust, held on the meadow in Runnymede next to the River Thames to commemorate 800 years since the signing of Magna Carta, the foundation of British democracy. Here are some pictures from the event, including artwork, St Catherine’s winning flag ad the new Magna Carta brown tourist sign. 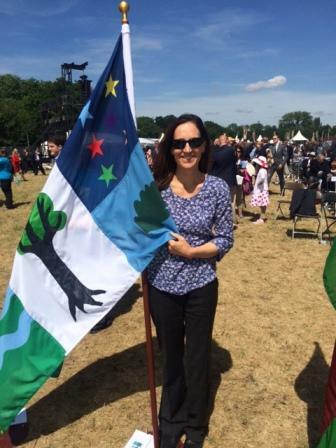 Each school in England invited to enter flag design competition, winning flag for Surrey was designed by St Catherine’s School. June 17: SCC highways design team site visit to discuss highways projects for Haslemere. I have secured Waverley Local Area Committee funding for highways improvements schemes that aim at improving road safety by focussing on speed reduction at the main “gateways” into the town. Works to replace the railings on the corner opposite the town hall started on June 29th, after a very frustrating delay of over a year. The other “gateway” schemes will follow on from this. I have also asked that the works include the long overdue snagging of the Shepherds Hill and Lower Street railings. 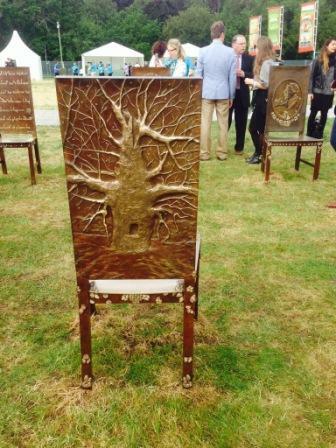 This was a project implemented prior to my election, and cost the tax payer £46,000. June 17: Haslemere Vision steering group meeting, provided update on travel plan proposal, which will involve partnership working between Haslemere Vision, SWT and SCC. June 22: SCC highways cycling officers and Waverley Cycle Forum members site visit Haslemere to look at possibilities for cycle improvement schemes in Haslemere. SCC has agreed a Surrey Cycling Strategy, with local communities encouraged to identify local cycle priorities. June 22: SCC highways meeting to discuss additional schemes, agreed to fund additional 2 weeks of vegetation gang, general signage de-cluttering and rationalisation. June 22: Grayswood School, site visit with school head, Grayswood Traffic Liaison Group representatives and SCC highways officer to look improving pedestrian crossing safety outside the school. Agreement on new drop kerbs, new parking restrictions are needed – agreed we would request these additional lines to be raised for approval at the June 26, Local Area Committee. June 23: Scotland Lane residents to discuss concerns about overhanging trees and traffic speeds, agreed to request SCC highways officers for tree assessment. I received information recently about a new and exciting initiative in Haslemere called Haslemere Hub for local small business owners. Their meetings are every Tuesday at 11am at Haslewey. Every week there will be an interesting and insightful workshop/presentation followed by a chance to meet fellow local independent businesses. Their meetings finish at 1pm so little time away from your projects. On twitter: @HaslemereHub. On Facebook here. Transition Haslemere’s summer activities are all listed here. This entry was posted in Councillor Barton Update and tagged Brighter Futures, Cllr Nikki Barton, Haslemere, Haslemere Hub, Haslewey, Haste Hill, Lion Lane, Magna Carta, Stepping Stones, Surrey County Council, Transition Haslemere, Waverley Local Area Committee on July 13, 2015 by admin. 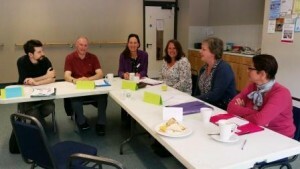 Yesterday (8th June) I attended a Brighter Futures session at Haslewey. This course was run with finding from my member’s allocation. Brighter Futures offers a series of informative and inspirational workshops to help you make changes to how you work and live. This evening (9th June), I attended a Waverley Cycle Forum meeting. The Waverley Cycle Forum brings people together with the aim of improving cycle facilities throughout the borough of Waverley in Surrey. Economic Prosperity, Environment and Highways Board – County Hall, Kingston. (This was the Environment and Transport Select Committee and has had a recent name change). Here is the agenda. 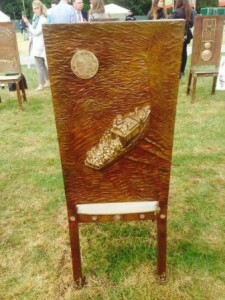 This entry was posted in Meetings and tagged Action for AT, Brighter Futures at Haslewey, Economic Prosperity, Environment and Highways Board, Haslemere Conservation Area, Orchard Club, Saturday Dust Cart, Waverley Cycle Forum, Waverley Local Area Committee on June 9, 2015 by admin. This entry was posted in Meetings and tagged Haslemere first, Independent, Nikki Barton, Surrey County Council, Waverley Local Area Committee on March 11, 2015 by admin. On 24 January 2014 a speed check was carried out by Surrey Police in Shepherds Hill, Haslemere, Surrey. According to data collected over 70% of vehicles were speeding, with some speeds reaching 59mph. We, the residents of Haslemere, petition Surrey County Council to look at introducing Siemen SafeZone in Haslemere to promote safer roads and reduce casualties in Haslemere. SafeZone combines Siemens’ new Sicore Automatic License Plate Recognition camera. The systems reduce serious accidents by 77% on average. There is a high level of driver compliance (99.4%). The camera has a compact design to reduce street impact. A single camera is used for two lane bi-directional traffic which reduces the project cost. The branding and technology enable a community-based approach to enforcement. Siemen SafeZone is a scheme whereby the goal is to construct an individual and ideally self-financing solution based upon locally retained funds arising from Driver Awareness course participation. This entry was posted in Haslemere first, Meetings and tagged Surrey County Council, Waverley Local Area Committee on December 8, 2014 by admin. To receive any declarations of disclosable pecuniary interests from Members in respect of any item to be considered at the meeting. In line with the Relevant Authorities (Disclosable Pecuniary Interests) Regulations 2012, declarations may relate to the interest of the member, or the member’s spouse or civil partner, or a person with whom the member is living as husband or wife, or a person with whom the member is living as if they were civil partners and the member is aware they have the interest. Members need only disclose interests not currently listed on the Register of Disclosable Pecuniary Interests. Members must notify the Monitoring Officer of any interests disclosed at the meeting so they may be added to the Register. Members are reminded that they must not participate in any item where they have a disclosable pecuniary interest. To receive any petitions in accordance with Standing Order 68. Notice should be given in writing or by email to the Community Partnership and Committee Officer at least 14 days before the meeting. Alternatively, the petition can be submitted on-line through Surrey County Council’s e-petitions website as long as the minimum number of signatures (30) has been reached 14 days before the meeting. Notice has been received of a petition from the residents of Latimer Road, Godalming which relates to on-street parking in this road. To answer any questions from residents or businesses within the Waverley Borough area in accordance with Standing Order 69. Notice should be given in writing or by email to the Community Partnership and Committee Officer by 12 noon four working days before the meeting. To receive any written questions from Members under Standing Order 47. To agree the Terms of Reference and membership of task groups and make any external appointments. To note and comment on the proposed programme. The Committee is asked to agree the transfer of its community safety budget for 2014-15 to the Safer Waverley Partnership. To note the arrangements now in place. To agree a response to the online petition presented at the previous meeting. The report explores increased delegation of decision-making in relation to local ‘early help’ for young people, within the context of re-commissioning for 2015 to 2020. The purpose of the report is to update the Local Committee on the progress that Services for Young People have made towards participation for all young people in Waverley in post-16 education, training and employment during 2013-14. To receive an update on the Committee’s improvement programme and on other highways initiatives. The report seeks the views of the Local Committee on the delivery of the Winter Service operations in the 2013/14 season, to feed back into the annual review. This entry was posted in Haslemere first, Meetings and tagged Surrey County Council, Waverley Local Area Committee on June 11, 2014 by admin. Here are the minutes of the March 2014 Waverley Local Area Committee. Apologies were received from Mr B Adams, Mr B Ellis and Mrs V Young; Mr A Young was absent from the meeting until Item 11, having indicated that he would be delayed. The minutes were agreed as a correct record. The following members requested that a non-pecuniary interest be noted in Item 9, specifically in relation to the applications for Highways Localism funding, on the grounds of their membership of Farnham Town Council: Mrs P Frost, Mrs C Cockburn, Ms J Potts. The text of two public questions received and the responses provided are attached at Annex 1. Mr D Pope, in a supplementary question to the response provided to Ms J Godden in relation to the on-street parking proposal for Courts Hill Road (West), expressed his continued concern that the response had not addressed the question presented. Residents feel that the proposal, if implemented, would result in unsafe traffic movements. He asked that the results of the statutory consultation be presented to the Committee along with details of objections and reasons for the recommendation. The Chairman explained the process by which objections would be assessed and undertook to ensure that the proposal for this location returns to the Committee for decision. The text of four member questions received and the responses provided are attached at Annex 2. 1. Mr R Knowles restated his concern that the signage for diversions away from the A3 remains inadequate and sought reassurance that progress was being made. The Vice-Chairman, as Chairman of the County Council’s Environment and Infrastructure Select Committee, confirmed that following a multi-agency meeting agreement had been secured from the Highways Agency for a programme of improvements which an officer working group was developing. The Area Highways Manager was asked to circulate an update to members on the proposed measures. 2. Mr D Munro asked for further detail on what the County Council and Local Committee can do to promote the needs of Farnham under the Local Enterprise Partnership’s funding regime for transport schemes. The Chairman explained that further detail would be provided in a report at the next meeting of the Committee. 4. Mr S Cosser thanked officers for the rapid response to his urgent question. He requested clarity on the prospect of at least one-way working not being feasible in Frith Hill Road and, in this event, the likelihood of remedial work being prioritised. He also sought assurance that he and the local residents’ association would be kept informed. The Area Highways Manager outlined the work needing to be undertaken before a decision on one-way working could be made: if feasible, partial re-opening on this basis would be at least two months away. Prioritisation of remedial works following flood damage is now under way, but it is likely that A-roads would take precedence. Mr Cosser and the residents’ association would be informed of progress. To agree to support the objectives of the Dementia Friendly initiative. (i) Note the progress of the Dementia Friendly Surrey project. (ii) Note the particular work being done to make Waverley more dementia-friendly. (iii) Agree that the whole Committee become a collective Dementia Friendly Champion, Mr S Cosser acting as lead member. Local Committees and members are very well-placed to help carry on the work of Dementia Friendly Surrey, making our communities better places to live for people with dementia, their family and carers. The Committee noted that the role of Champion would contribute to widening awareness of dementia and reducing stigma; Champions would also be involved in sustaining the initiative in the longer term. Members referred to the increasing pressure on day centres and the positive difference being made through increased awareness of dementia. Mr S Cosser felt that there would be a benefit in the whole Committee making a commitment to the project and offered to keep members involved in its future evolution. The Chair put this proposal to the Committee and it was agreed as (iii) below. To agree a response to the petition presented at the previous meeting. Resolved to note the response to the petition. The Committee is required to respond to petitions received. To note the progress made and the status of schemes, to consider the allocation of funding to support flooding recovery and to consider applications for funding under the highways localism scheme for 2014-15. (i) Note the effects of the recent extreme weather across Waverley and Surrey. (ii) Agree that up to £50,000 be allocated from the 2014/15 budget towards flood recovery works organised by the Area Team. (iii) Agree to note the 2014/15 Localism (Lengsthman) scheme applications submitted by Chiddingfold Parish Council, Dunsfold Parish Council, First Wessex (Sandy Hill and The Chantrys), Hambledon Parish Council, Haslemere Town Council and Farnham Town Council and that an application from Western Villages had now been received, and to delegate final approval of the total funding granted to each project to the Area Highways Manager, in consultation with local members and subject to officer scrutiny to ensure that the proposed works fall within the remit of the scheme. (iv) Agree to review the principles and process to be adopted for the allocation of the Localism (Lengsthman) budget in future years. The Committee recognised the need to contribute to flood recovery in Waverley and to support local enhanced maintenance on the highway through the Highways Localism scheme. The Chairman thanked officers for the work done in partnership during the recent extreme weather. Officers were asked to consider whether the legal delays experienced in the Marshall Road scheme should be escalated for resolution at a higher level. It was confirmed that the data in Annex 1 of the report referred to the 2013/14 programme only. The proposed allocation of £50,000 to flood recovery would be taken from the uncommitted sum for 2014/15. The extent of damage is currently being assessed and it is likely that remedial work to surfaces will begin in April. The poor quality of some repairs and early failures reflect the difficulty experienced by the contractor in complying with required timescales in adverse environmental conditions: the cost of remedial work is borne by the contractor. The Committee discussed funding for the Highways Localism scheme, noting that an application from Western Villages had now been received by officers. Some members continued to express their unease at the lack of equity experienced by areas where the parish council had not wished to submit an application; there was also concern at the lack of progress on a review of the processes involved. The Chairman proposed amended recommendations, which were agreed by the Committee as (iii) and (iv) below. To review progress in the first year and consider the programme for the second and subsequent years of the project. (i) The success of the countywide five-year programme in Year One. (ii) The progress of Operation Horizon roads, surface treatment roads and changes in Year One in Waverley as set out in Annex 1 of the report. (iii) The proposed programme of Operation Horizon roads for Waverley for Year Two (2014/15) and the remaining approved roads to be undertaken in Years Three to Five (2015-2018) listed in Annex 1of the report. The Committee requested an update of the project at the end of year one and an opportunity to review the programme for future years. The Committee welcomed the progress made in Year 1 and the high quality of the work completed. In view of the significant and costly damage sustained by the network over the winter, discussions are under way with central government with a view to bringing a plan for remediation to the full County Council in April. There may be an impact on the Horizon programme, but it is hoped that this can be preserved. The Committee discussed the extent and timing of individual schemes in the programme. It was noted that members needed reasons for adjustments to the programme. Officers had acknowledged that local committee members should be provided with more detailed and timely information on progress and changes and enhanced communication methods were under consideration. It was pointed out that the requirements of developers presented a particular challenge in scheduling work in Waverley and officers were collaborating with Planning colleagues on this point. Officers were reminded that multiple road closures in a relatively small area might have a major impact on traffic flows across a much larger area. To comment on a draft update to the County Council’s policy on setting local speed limits and a new draft policy to address road safety outside schools, including school crossing patrols. Resolved to request that the Committee’s comments on the draft policies be noted and taken into account, prior to the policies being submitted to the County Council’s Cabinet for approval. Local Committees are responsible for most highway and transport matters in their area, including speed limits and road safety measures outside schools. This report presented draft road safety policies with respect to speed limits and road safety outside schools for comment by the Local Committee prior to submission to the County Council’s Cabinet for approval. The phrase “outside schools” needs to be interpreted with some latitude, as roads, paths and hazards at some distance may have an impact on the safety of students’ journeys to school and on the range of travel options considered by families. Extensive parking in roads around schools can have a significant impact on safety. The acknowledgement that signage alone has little impact on speeds was welcomed. It was proposed that local committees should be entrusted with making correct decisions on speed limits, even if their decisions are contrary to Police and/or officer advice: it was suggested that referral to the Cabinet member should be by exception, e.g. through a call-in procedure or perhaps in relation to strategic routes. Although low-cost interventions can be delivered quickly, substantial schemes are likely to take a long time to implement. The provision of signage should be balanced against the wish of some neighbourhoods to “declutter” and resist urbanisation. The impact of building developments on the safety of routes to school must be taken into account and incorporated in the planning process. There should be a greater emphasis on the role that schools and parents themselves can have in promoting road safety. To note the proposed forward programme and agree any additional items for inclusion. Resolved to agree the Forward Programme as outlined in Annex 1 of the report. Members were asked to comment on the Forward Programme so that officers can publicise the meetings and prepare the necessary reports. The Chairman informed the Committee that some reports scheduled for the June meeting would be moved to September to ensure a better balance in the size of agendas. The wish to develop an understanding of Children’s Services was expressed. This entry was posted in Haslemere first, Meetings and tagged Surrey County Council, Waverley Local Area Committee on April 1, 2014 by admin. The next Local Area Committee meeting will be on Friday, 5 July 2013 2.00 pm at Hale Institute, Wings Road, Farnham GU9 0HN. This entry was posted in Haslemere first, Meetings and tagged Independent, Independent Councillor, Surrey County Council, Waverley Local Area Committee on June 25, 2013 by admin.